“Before we bought our laser-cutting machine, 1-in.-thick steel was sheetmetal to me.” So says Magnum Steel Works vice president Johnny Czerwinski, who along with brother and company owner Jim Czerwinski recently took the 10-yr-.old firm, specialists in repair and rehabbing field-worn coal-mining equipment, into the world of sheetmetal fabrication. Just six months after Magnum Steel installed its new laser-cutting machine, it’s operating at nearly full capacity, two shifts per day. 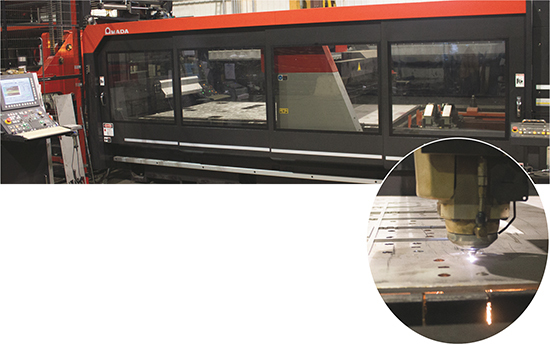 The Amada FOM2 RI (rotary index) 3015 machine is equipped with a six-shelf sheet-storage tower to efficiently move cut nests and fresh sheets in and out of the laser-processing cavity. The machine also is equipped to process round, square and rectangular tube and pipe, as well as C-channel and angle iron. In mid-2014, Magnum Steel Works down-gauged its capabilities to exploit opportunities in fabricating material 3⁄8-in. thick and less. With one purchase order (from Amada) came three press brakes, a CNC turret press and a 4000-W CO2 laser-cutting machine. And, in less than six months, the startup sheetmetal shop is near capacity; more equipment likely is on the way soon, according to the Czerwinski brothers. That equipment includes a waterjet-cutting machine, and a 500-ton by 12-ft.-long press brake that performs well on heavy plate, but not quite as well on thin-gauge work. Taking on the additional sheetmetal work quickly maxed out the firm’s fabrication capacity, leading to excessive overtime. 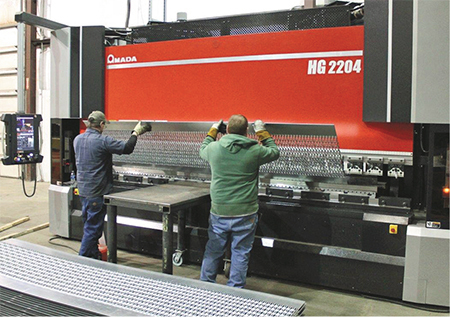 A quick decision by the Czerwinskis, following a trip to FABTECH 2013 in Chicago, led to the purchase order for the Amada armada of fabricating equipment. That equipment landed at the firm’s original 33,000-sq.-ft. plant in Mt. Vernon, IL; the rest of the company works out of a nearby, brand-new, $13 million 128,000-sq.-ft. facility that includes an expansive machine shop, paint room and multiple welding stations. A selection of parts processed on the new laser-cutting machine includes (left) a section of tubing that is first laser-cut to length and then notched on one side. After cutting, the pipe is bent and placed in a jig for welding. Laser-cutting the notches, compared to machining, proves to be considerably faster, more accurate and more repeatable in terms of weld fitup. Opportunities, indeed—in just six months, Magnum Steel’s laser-cutting machine is operating at nearly full capacity, two shifts per day. It’s an FOM2 RI (rotary index) 3015 model with a six-shelf sheet-storage tower, twin pallets to efficiently move cut nests and fresh sheets in and out of the laser-processing cavity, and—via a mere 2-min.-or-less changeover process—the ability to process round, square and rectangular tube and pipe, as well as C-channel and angle iron. The machine arrangement, says Porro, is the first of its kind combining a sheet-storage tower and rotary index, specially engineered and developed by Amada engineers and technicians at the request of the Czerwinskis. Following a trip to FABTECH 2013 in Chicago, Magnum Steel placed a purchase order for an armada of Amada fabricating equipment, including three new press brakes (one shown here). The Model HG 2204 brake is equipped with a 19-in. multi-touch LCD control panel and user-friendly screen designed, say Amada officials, for intuitive operation regardless of operator experience. Included in the kit is a section of 13⁄8-in.-dia. round tube, 0.083-in. wall thickness, that Magnum Steel’s laser cuts to length and then slices at a 45-deg. angle on one side. After cutting, the pipe is bent to a 90-deg. angle and placed in a jig for welding. “The ability to cut the pipe to allow the welding operation is a big time-saver for us,” says Johnny Czerwinski. “Otherwise, we’d have to weld two pipe sections together. Among the unique features of the laser-cutting machine noted by Johnny Czerwinski is oil-mist piercing—a technique Amada refers to as spatter-free pierce (SFP). This technique finds use, say Amada representatives, when piercing and cutting small features within a part. The oil mist helps to prevent the molten metal from the pierce from sticking to the work surface around the pierced hole. This proves useful because the machine’s height sensor may detect the mound of spatter should it grow too large and cause an unexpected—and unneeded—increase in nozzle standoff. This, in some cases, can lead to poor cut quality. For cutting thicker plate, the FOM2 machine offers water-assisted cutting. Here, a water mist cools the workpiece surface enough to allow Magnum Steel and other users to nest parts more closely together. And, since heat buildup is minimized, there’s less need to program the cutting head to jump around the nest to help balance heat input to the sheet. Versatility always attracts more eyes. And here in this point it dictates the same. In reality the more features you have in your Cutting tools the more you can get to short out. I'm also looking to add some more stuffs in my laser cutting tool.